The federal government shutdown became the talk of the town in the last few weeks. It not only created emotional stress and financial chaos but also highlighted underlining financial problems in the country. Despite a low unemployment rate and robust economy, Americans are still living paycheck to paycheck. They are not yet ready to combat a financial crisis, and that’s bad. The federal government shutdown was a big reminder of our financial vulnerability. Unpaid workers borrowed money, applied for unemployment benefits, and turned to food banks to survive the shutdown. The shutdown taught a big financial lesson to us, and that is, we need to be ready for emergency situations. Recession can come anytime or another shutdown can happen in the near future. We should be ready to deal with all kinds of situations. 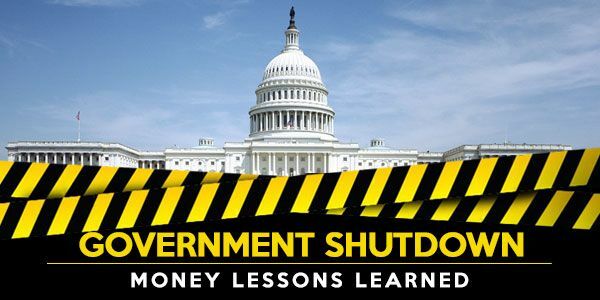 Let’s discuss the 5 money lessons we learned from the government shutdown in detail. It’s never too late to learn lessons and be ready for the next phase of our financial life. According to a survey conducted by Bankrate.com, only 40% of people can afford to pay an unexpected expense of $1000. This is a sharp reminder of the fact that we need to stop living paycheck to paycheck. We are walking on a tight financial rope, and a small emergency expense is enough to topple us down. Most of us are not even ready to cover an emergency expense. This thing needs to change. According to a survey conducted by Nerdwallet, 62% of employed citizens of the country can’t cover their living expenses for more than 3 months if they are laid off. The government shutdown is over. The federal employees are relieved but they are hurt too. The crisis period is over. But the ultimate question is, “Can anyone guarantee that there won’t be any government shutdown in the future?” What shall we do if we lose our jobs tomorrow? It’s high time we give up this bad financial habit and start thinking about our financial future. The partial government shutdown was a big shock for the federal employees. Without any paycheck, they were in a complete financial mess and couldn’t even pay credit card bills generated due to their work-related expenses. This is the condition of the federal employees who earn a big fat paycheck from the government. I’m not even in a state to comment on the financial condition of the people working in the private sector. The federal government shutdown was a big lesson for all of us. Whether you work for Uncle Sam or a business entrepreneur, you should create an emergency fund immediately. It’s true that you have to restrain yourself from impulsive shopping behavior and expensive dine outs, which is not at all enjoyable, but it’s necessary. You need to have an emergency fund for covering your unexpected expenses. If you don’t know how to create one, then here are a few strategies you can use to build a fat financial cushion for yourself. Thank god! The shutdown is finally over! Urgh! I don’t know what would have happened if it went on for a few more days. The federal employees were in a huge financial crisis and payday loan companies were enjoying that situation. If the impasse continued for more days, then federal employees would have been forced to borrow payday loans at a high-interest rate. The consequence would have been disastrous. A huge percentage of them would have been in payday loan debt later. Obviously, payday loan debt relief programs could have helped borrowers to get out of debt. But the main question is, how many people know about these programs? How many people know the ways to select the best payday loan debt elimination program? A household budget can help to handle a sudden financial challenge without borrowing loans. It can help you monitor your expenses and create an effective spending plan, which is essential for saving money. You can’t possibly create an emergency fund without saving money, and that’s where the household budget comes into play. OVLG recommends creating a household budget as per the 50/30/20 rule. Don’t have any idea about this particular rule? Read this article to get all your answers. If you don’t find any area in your household budget for savings, then there a few tough decisions you have to make. You have to give up a few luxury expenses to save money. Maybe you can stop having weekend dinners at an expensive restaurant. Most of us have a bad financial habit. We spend first and save later. Somewhere down the line, it means that we give a low priority to savings, which is wrong. It’s just the opposite of what we should do. Ideally, we should save first and then spend later. But that rarely happens. It’s best to make savings automatic. You’ll be forced to save money every month. Open a high-yield online savings account and earn more than 2% interest on the amount you deposit there. Decide an amount that you can afford to set aside every month and have it automatically credited into your savings account. This is your emergency fund. This is your ‘financial buddy’ who will help you during the rainy days. But don’t touch this savings account unless there is an emergency situation. Many individuals thought that they could skip filing tax returns owing to the shutdown. They thought tax officials were on leave and that made the whole situation complicated. The truth is something different. Tax laws were in effect during the shutdown. 46,000 IRS officials were called back to work on an unpaid salary during the government shutdown. Almost 60% of the workforce was there to help process tax returns. The IRS began accepting tax returns from early January and will continue to receive them till April 15, 2019, unless you request for an extension. What does that mean for you? Save money and file your income tax returns even when there is a federal government shutdown. So, don’t waste time and lose the opportunity to receive refunds quickly. Here’s how you can file income tax for free. If you’re a federal employee and you have credit card debt, then you must settle it as soon as possible when there is a government shutdown. You can also transfer the balance to another credit card with 0% APR to get rid of accruing interests. No one can say when you will receive your next paycheck. You have to manage everything on your own, and this includes your credit card bills. If you decide to pay credit card bills after receiving your next paycheck, then be prepared to pay high-interest rates due to the compounding interests rates. Can Trump stop government shutdown post-Obamacare defeat? College debt rises while the DOE sleeps: Is President Obama listening?